Harlan started working in glass in the 1990s. 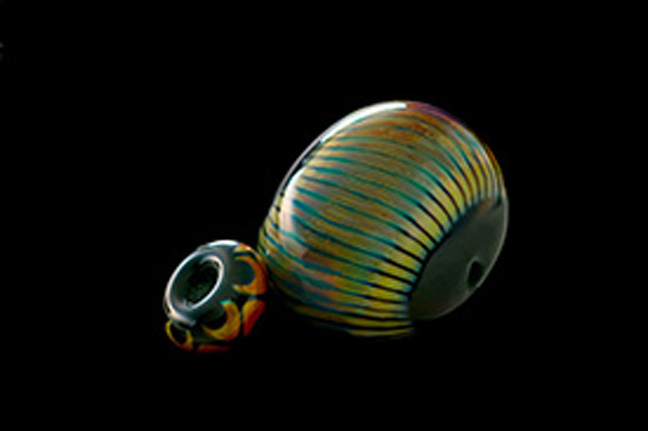 Harlan Simon is a Bay Area jewelry designer and glass worker. Harlan has introduced hundreds to the magic of flamework glass, teaching at the City of Oakland’s Studio One Art Studio, home to Northern California’s oldest public flamework program. 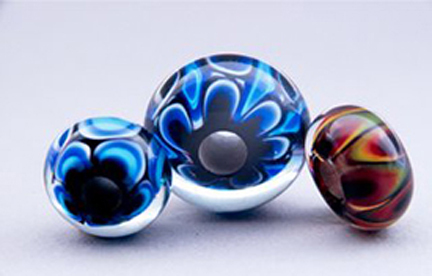 Harlan helped found the Northern California chapter of the International Society of Glass Beadmakers in 1997. His work appears in Lark Books’ 1,000 Glass Beads and Complete Book of Glass Beadmaking. Two Peacocks and a Harlanquin, Effetre glass. Small Eclipsed Delta on Black Base, and Silvered Ribbed Pattern Organica on Black Base, Effetre glass. Small bead diameter is 22 mm. Large bead, 40 mm.